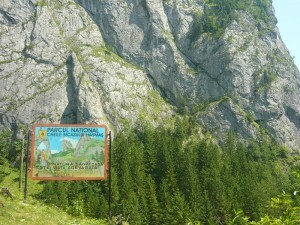 Cheile Bicazului (Bicazului Gorges) is one of the most spectacular sights you will see in Romania. The canyon dug by the Bicaz river, which has eaten through rock to make it way down has created an area of serpentines closely surrounded by the tall, rocky walls of the mountain. 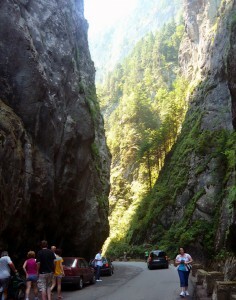 You can drive through the gorges – the road is narrow, but two cars can drive one past each other easily. But despite the fact it is one of the most spectacular drives, most people prefer to park and walk – the scenery is amazing. The recent heavy rains have increased the level of the water – Bicaz, which has eroded the base of the street, so on some portions the road is narrow, as it has not been fixed yet. With the walls caving down on you, bits and pieces of vegetation which grew in odd places and trees up on the rocky peaks, small waterfalls coming from cracks in the rock – this place will give you the peace and quiet you might have been longing for. Although it might not be entirely true about the quiet – it is full of tourists, we've seen a lot of foreigners there, mostly Hungarian. But still, it gives the sentiment of a cathedral. If you're into buying gifts and souvenirs rather than just taking pictures, sellers through about it and there are traditional items on sale in the area – clothing, wooden objects, alongside Chinese-made toys and other small gadgets for tourists. The Bicazului Gorges are part of a natural park called National Park Bicazului Gorges – Hamas, which lays over 6,500 hectares, and which includes the other place we recommend – the Red Lake (Lacul Rosu). The Red lake is yet another amazing creation of nature. This one is more recent than Bicazului Gorges. 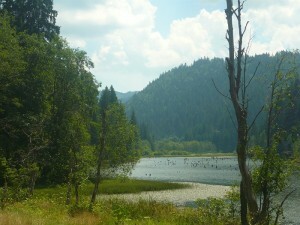 The Red lake is first natural dam lake created in Romania. In 1837, one of the massifs in the area collapses and locked the Bicazului Valley close to the Bicazului Gorges, which created the lake. The name of the lake comes from the Red Creek, which passes through iron oxide and hydroxide layers. 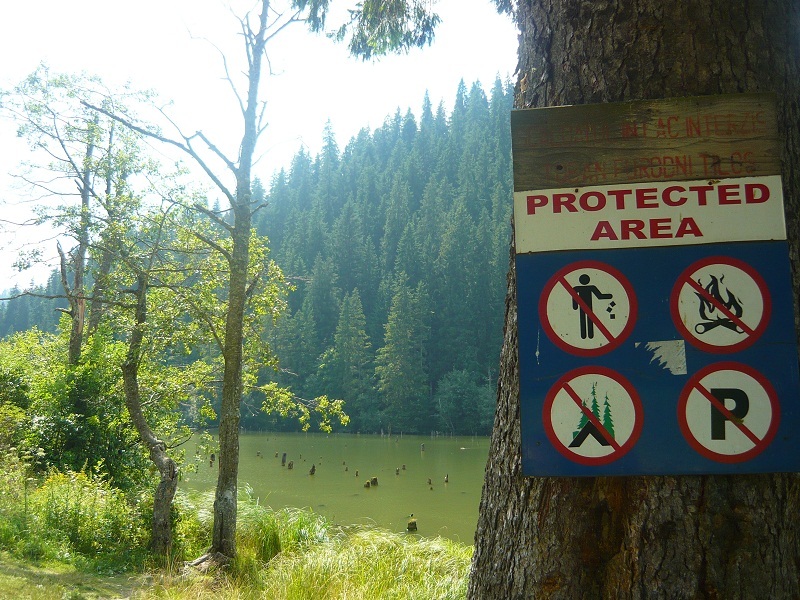 The lake is called Mordersee in German and Gyilkos in Hungarian – which both mean Killer. The legend says the mountain collapse killed a shepherd and his flock. You will notice that there are half-tree trunks in the lake's water – there used to be a forest in the valley which was invaded by water after the rock cliffs collapsed. 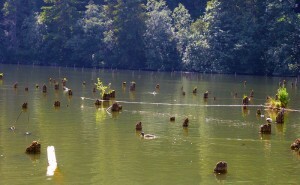 The lake tells the story of the sunken forest. The image is a bit scary at some point, with the tree trunks coming out of the water. Navigating through them by a small boat – they're renting boats there- will not be an easy task, although most of the crowded lake area is not navigable. If you're driving from Bucharest, take the E85 European road (four lanes, one of the good roads in Romania) until Bacau – 245 kilometers, about two and a half – three hours by car. 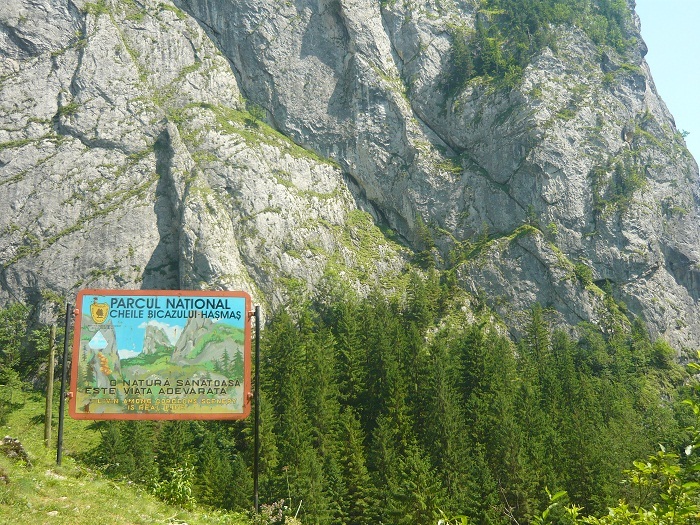 From there, you take the left road to Piatra Neamt, which is 58 kilometers away. Then follow the road from Piatra Neamt to Bicaz, and once you make it to Bicaz, follow the signs to the Red Lake and Bicazului Gorges (you should go again left). Halfway on the road to Gheorghieni you will find these two tourist sights. There's accommodation available in the area - mostly pensions, in almost all the villages around these sights. If it's during the peak summer season, you should look around on the Internet and book rooms in advance. You should also know that some of the roads in Harghita county, going through some of the villages, are not very good - without joking, it's preferable to have a four wheel drive. Our next Travel Planner will cover the Izvorul Muntelui dam and Borsec, home of the mineral water springs.